This website is being built and operated as a hobby, instead of mounting the stamps in an album and then writing them up, I thought that I would scan them and do the write-up online. This means I can leave the stamps in the bank but still see my collection whenever I want. It is not yet finished and I doubt that it ever will be....you know what it's like when you collect things! I welcome any comments and corrections offered by anyone who wishes to contribute. This is in fact, one of the reasons for building the site - there must be a great amount of information out there that I have yet to stumble upon. I have to thank all those who have contacted me and offered help with Chinese and Japanese translation, and also those who have pointed out some of my errors. My particular thanks goes to Travis Searls of the Rocky Mountain Philatelic Library, his help and encouragement has been invaluable in many ways, and to Professor William Chen for kindly providing information about some of the more obscure revenue stamps and labels. I would also like to thank Neil Kaplan for his advice in areas such as bonds and currency and Richard Arent for his Japanese translation and general expertise. Date 1st March 1934 (or Kāngdé 1, March 1st). 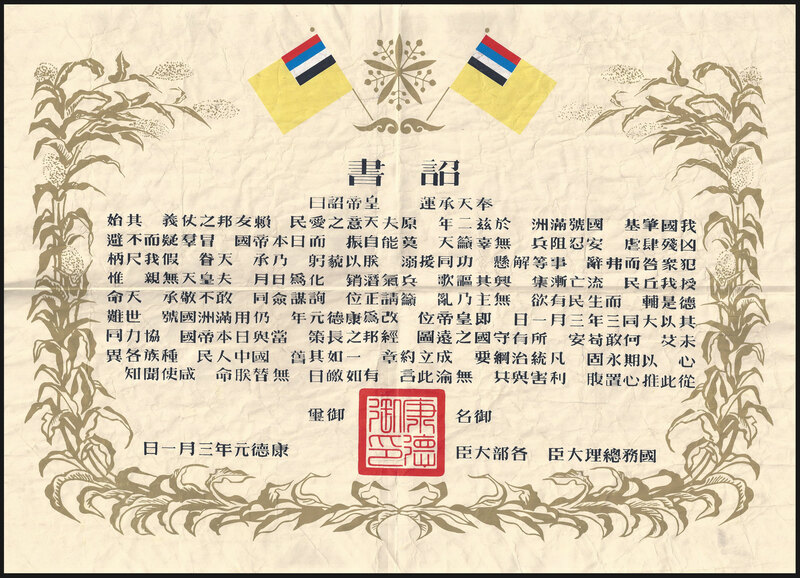 The document shown above is the Edict to announce the transition of Henry Puyi from First Executive of Manchukuo to Emperor Kāngdé. (Translation by Ge Rong of Changsha, Peoples Republic of China). 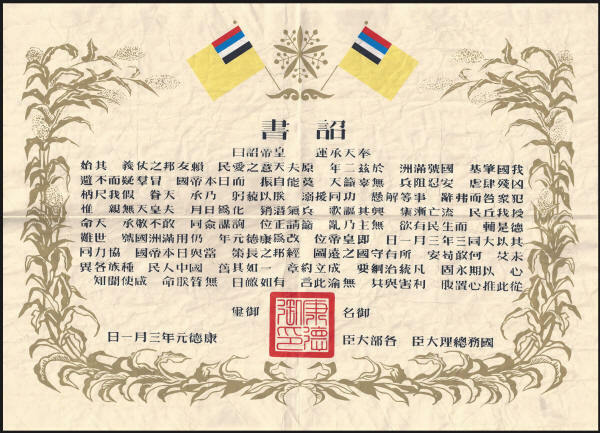 I have added some items of postal history that I think are interesting and which help to illustrate some of the history of Manchukuo that fails to get a mention in the stamps, also some ephemera for a similar reason. ALL of the stamps photographed or scanned for use on this website are part of the same collection and come from no other source unless stated, not all are perfect and on some occasions used stamps appear where mint stamps are missing. Most pictures used have been "sharpened" and the contrast has been slightly increased to improve appearance on your screen. You can enlarge the pictures by clicking on them, and to get the best resolution try clicking twice. With regards to varieties, some are shown but many are not. I will be adding these as I find them (or, and let me be honest, when I can afford them). This is not a commercial website although I hope eventually to set up a simple shopping cart to offer collectors the chance to acquire any unwanted duplicates, the proceeds from these sales will be used to enhance the collection. Please let me know if you have something to sell, especially if it is something that I am missing.